Who? Digital content manager for Mansfield Chad. What? Heads up the online operation for the Mansfield Chad newspaper in Nottinghamshire, UK. This entry was posted in Recommended journalists and tagged #followjourn, Chad, digital content manager, manager #FollowJourn, manager for Mansfield Chad, Nottinghamshire, online operation, Tom Pegg, United Kingdom on July 22, 2009 by Mykel Hutchinson. Who? Web editor for the Worthing Herald. What? Digital content and social media editor Worthing Herald series and Chichester Observer series. This entry was posted in Recommended journalists and tagged #followjourn, content and social media editor, editor, Sarah Booker, the Worthing Herald, web editor, Worthing Herald on July 20, 2009 by Mykel Hutchinson. What? At Times Online; currently trying to be engaging for the news desk. This entry was posted in Recommended journalists and tagged #followjourn, editor, Lucia Adams, web development editor on July 16, 2009 by Mykel Hutchinson. The accuracy and standard of science journalism in the UK is increasingly scrutinised online – just take a look at the Bad Science blog network for evidence of that. How can journalists become better equipped to report science? Would more specialised journalistic training help? A new MA in science journalism at City University in London is designed in response to a ‘rapidly expanding vein of journalism,’ according to the course outline. During the course, a result of ‘consultation with the UK’s leading science journalists and scientists,’ students will be taught to be ‘critical consumers of scientific information’. The course will be led by Connie St. Louis, a former BBC science journalist. Potential students are promised ‘a range of opportunities’ to report on science, health, environment, technology and food. This entry was posted in Journalism, Training and tagged BBC, blog network, City University, City University in London, connie st louis, food, London, MA, Science journalism, science journalist, United Kingdom on July 15, 2009 by Mykel Hutchinson. A new media company is teaming up with one of the UK’s largest magazines to create a green and ethical supplement and needs two interns to help them inform people on ethical issues and green living. Details are on a need to know basis at the moment, but there’s a very big name editor lined up to work on the project. One of the interns must be a ‘star of the future’ for environmental journalism and could become the supplement’s editor in time. Their role will be to help with content for the website and editorial planning for the magazine, as well as writing advertorials. The second intern will be a Green Press person and should also have an interest in music PR. They will be working with a green record company and with Britain’s greenest festival. To apply or for more details email: alex.lockwood@sunderland.ac.uk or contact him on Twitter @alexlockwood. This entry was posted in Jobs, Training and tagged Britain, editor, Environmental journalism, Intern, media, name editor, United Kingdom on July 15, 2009 by Mykel Hutchinson. The Independent and USA Today have both launched new tools for accessing news headlines. 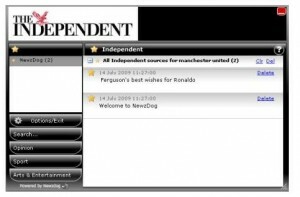 The Indy’s Newzdog widget and Newsdeck both aim to alert users about daily headlines. The Independent’s version is a downloadable widget that notifies you of the latest news headlines relevant to the topics of interest that you specify. The widget can be minimised to a yellow star on the system tray and when there is a news story of importance to you the star turns red. Moving on to USAToday’s Newsdeck – the site collects headlines from the paper’s website and organises these into up to eight different subject areas, such as life, travel etc, making it easier for users to find what they are looking for. Each of the sections allows you to scroll down to see more, which links to the full story. 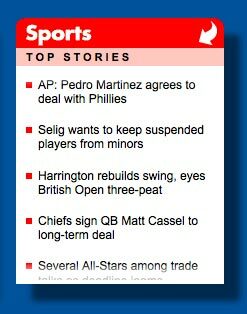 There is also an option to switch between the top stories and the most popular stories. This entry was posted in Handy tools and technology, Online Journalism and tagged editorial director, Independent.co.uk, Jimmy Leach, the Independent, travel etc, USA Today on July 15, 2009 by Mykel Hutchinson. BreakingNewsOn (BNO), the breaking news service based around Twitter, has just announced that it will soon be using Apple’s ‘push notification’ to send breaking news to iPhone users. The launch is the latest development for the service: founder Michael van Poppel told Journalism.co.uk in February of plans to establish a website for BNO. It is expected to launch in the week of the August 3. BNO reports many stories a day and does not intend to ‘push’ all of the headlines to their users, it said in a release. The service has decided that editors will be selective and only send alerts ‘when important headlines break’. But users will also be able to get updates from a second stream intended for ‘news junkies’ or journalists. Subscribers to this channel will receive more notifications. Users of the app will be given the option to choose what volume/what major news stories they receive alerts via a ‘push’ and can also use the service to find other stories that they were not alerted about. The application will cost $1.99 to download and then $0.99 per month after that. BNO said it is also considering expanding the service to other platforms such as the BlackBerry. This entry was posted in Handy tools and technology, Mobile, Online Journalism and tagged BNO, BreakingNewsOn, iPhone, Journalism.co.uk, Michael van Poppel, Twitter, USD on July 15, 2009 by Mykel Hutchinson.